Thank You, Murali. Not too many people have a kind word to say about the Hon’ble High Court at Calcutta. But you had the gumption. And for that, you shall soon see, you will rise to the absolute top. I shall do anything and everything to protect the honor of Calcutta. For me, all else is secondary to that City – my love, my life. 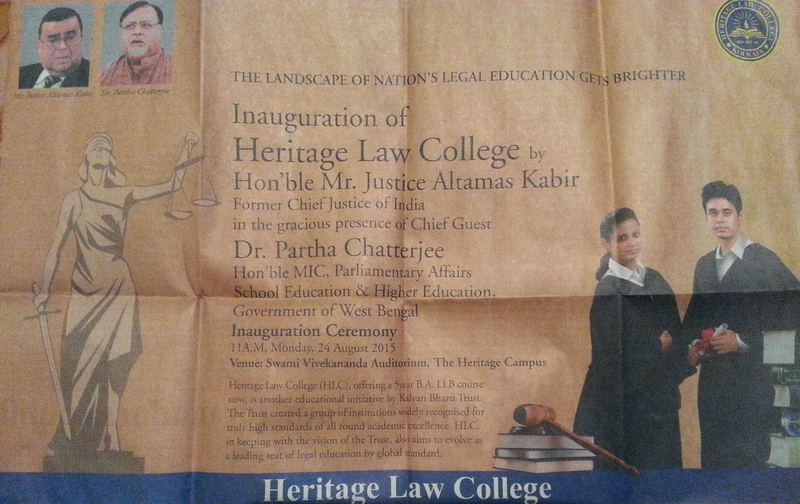 I recently read how Hon’ble Justice Altamas Kabir inaugurated The Heritage Law College. I will go on record to say, The Heritage Group, has admitted many a friend of mine in lieu of ‘donations’. HEFTY DONATIONS. Does it befit a Former Chief Justice of India to inaugurate such a controversial institution? Do not ask me for proofs. Proofs are for fools who hesitate to believe. And then I read, Mr. Kabir is in the reckoning for the post of the Chairman of the National Human Rights Commission. Appoint him, if you want. I certainly do not have the power to stop you. But I shall tell you this. And I shall tell you without faltering at all. If there is one Supreme Court Judge who surpasses all in terms of his corruption, it is Hon’ble Justice Altamas Kabir. Save Calcutta. Save the Law. And Murali, I hope you keep on writing fearlessly. I am not merely an Advocate from Calcutta. I am Calcutta.